A more extended recipe can be found here. This medieval recipe involves far more than just buttermilk, and includes onion, cornflour and bacon. Vegetarians can replace the bacon with seitan or something else creative, though the buttermilk is hard to replace so vegans best just read on to another recipe. The full recipe can be read here (through Google Translate). Believe it or not, but you won't die from eating roses or pansies. Commoners in medieval times found them delicious, and made a salad out of it. Although they did add egg to it, so apparently by themselves they might be not that good. On the other hand, another ingredient is lettuce, which is sort of the same thing: raw plant leafs. So who knows, in five hundred years people might wonder why we ate lettuce in the 21st century. The recipe, translated by Google, can be found here. We marked this recipe vegetarian because of the egg, but vegans can just leave that out, probably. The author of this blog post is from Katwijk, which was historically a fisherman's town, and even in present days, fish is eaten a lot in Katwijk. Hence, when reading a recipe for "fake fish", the inevitable question arises: Why?? Why would you take the effort to make something that looks like fish but isn't? Surely it's much more animal-friendly, but in the 16th century, which is when the cooking book was published in which this recipe was printed, animal welfare wasn't quite an issue like it is today. The answer is however nothing like that. During Lent time, catholics aren't allowed to eat any fish. And apparently, catholics like fish as much as Katwijkers do. 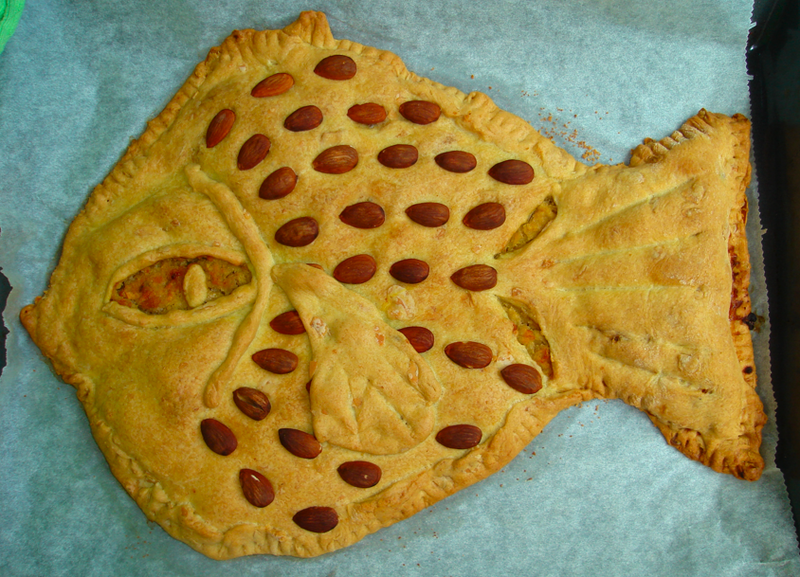 The solution: Make an apple pie shaped like a fish. Yes, apple pie. Shaped like fish. Why? Why???? The recipe can be found here. Basically it's just apple pie but without butter and eggs and with oil and ground almonds instead, which makes this recipe vegan, and different from just a fish-shaped modern apple pie. Fish needs to swim, as we always say. And by that, of course, we mean that a glass of wine should be served with the fish. So what goes better with fake fish than a glass of fake wine? The recipe on this website makes it easy for you though, letting you take a bottle of wine and then add the ingredients to it that turns wine into clareit (basically, that's just honey and water). Buttermilk sauce with beans, some quince jelly, a flower salad and a fake fish, served with some clareit. Have a nice forgotten meal!